This contest runs from August 4 to August 25 of 2008. 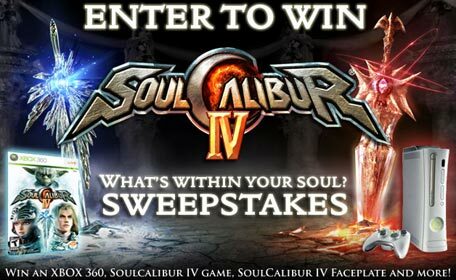 To celebrate the launch of SoulCalibur IV, Cheat Code Central is giving away 1 Xbox 360 + SoulCalibur IV Game + SoulCalibur Swag, 2 SoulCalibur IV Games + T-Shirt, and 5 CCC T-Shirts! 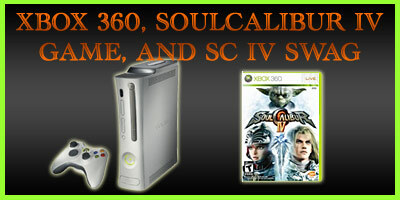 Just enter your Name, Last Name, and E-Mail Address in the form below to win! It's as simple as that. Shortly after the contest ends, we will post the winners on this page and also notify them by E-Mail. Check back soon to find out if you're one of the lucky winners! Please submit your name ONLY ONCE in order to be eligible. The information that you submit here will only be used for this contest. We will not give or sell your information to any third parties. 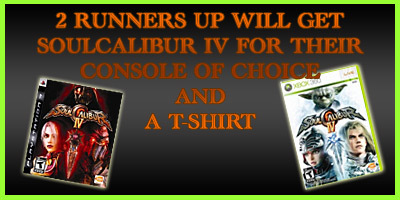 You could also win 1 of 5 Cheat Code Central T-Shirts!